My son Graham turns four next month and if there is one thing I can say for sure about him, he is crazy about trains. In particular, Thomas the Train. Crazy, maybe, to the point of obsession. He watches Thomas every morning on Sprout. He goes to bed every night watching Thomas on YouTube. 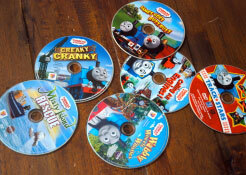 We own a dozen or so Thomas DVDs, each of which he’s watched probably twenty times. We’ve gone for a ride on the “real” Thomas in Strasburg and driven to Six Flags in Bowie, Maryland to visit Thomas Town and we’ve gone to Thomas the Musical. 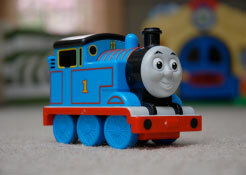 His Thomas train set has taken over the entire playroom and includes all his favorite engines – Thomas, Percy, Emily, Diesel 10, Hiro, Molly, Rusty, Salty, Spencer, Victor and I’m probably forgetting a few. 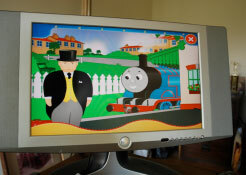 He has Thomas books, Thomas iPad apps, Thomas sippy cups, Thomas placemats, Thomas pajamas and Thomas underwear. Does this seem a little much? There was an article in the New York Times not long ago that talked about this very subject. And the gist of it was that no, it’s actually a good thing. Kids who obsess over a single thing often turn out better in the long run than kids who just show a passing interest in a bunch of things. That passion can lead to feelings of confidence and accomplishment because they have developed mastery of the subject matter. Some of the most creative people I know have, shall we say, unique interests. My friend Anthony, who is an amazing photographer, also happens to be a taphophile – which, in case you didn’t know it, is a person with a passion for and enjoyment of cemeteries. Which gets us back to the idea of passion, which is the driving force behind obsessive behavior. You cannot do great creative work without having passion for the subject, or at least for the process. So go ahead – run with it. Keep playing Angry Birds. Work on that garden gnome collection. Join that fantasy league. Keep tinkering with that ’82 Camaro. Just don’t cut your ear off. I don’t know if Graham will turn out to be a creative genius. I see some encouraging signs. One thing I do know, though… we aren’t finished building that Thomas collection.